LAMP. Completely wired with switch on shade, has an extra long, flexible, vinyl coated gooseneck to light any point on the machine. The swivel shade "tilts’ to direct the light where you want it. Accepts a 100 watt bulb for maximum illumination. Double insulated, of course. DRIP TANK. Made of crystal clear acrylic so you can "see" your coolant level easily. Possible contamination shows up instantly. An accurately-machined black lid keeps out foreign material. Solid brass and copper fittings allows you to accurately control the flow of coolant to the lap. The tank assembly "lifts off" for quick and easy cleaning. DOP SET. 14 solid brass, precision-turned, keyed dops, table dop and convenient holder for all items. TRANSFER FIXTURE. Spring loaded, one piece cast construction for fast and accurate alignment of dops. FUNDAMENTAL FACETING. a 32 page illustrated instruction book and basic primer covers faceting for the beginner. Faceting and the Graves machine are covered in-depth. Includes information on gem selection, critical angles for faceting as well as details on grinding and polishing. PLASTIC TUBING. extra-large drain tube will not clog - cutting material and debris are quickly flushed from splash pan; includes brass ferrule. 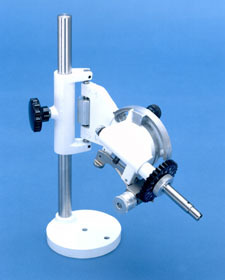 GIRDLE ALIGNER, a device to radially align the faceted gem; TOOLS and WHEEL WICK are also included. Designed specifically for the home - small, light-weight, easy to store and portable! An exactly duplicate of the proven Mark I machine except for the motor, switch and cabinet. A high speed, powerful, permanent magnet motor nestles inside the 17 1/2" cabinet together with a continuously variable speed controller. Faceting head and mast are investment cast aluminum/magnesium alloys that are machined and fitted to extremely close tolerances. All spindles and bar stock are precision-turned stainless steel for maximum durability and lasting beauty. All components are of space-saver size with the performance of a full size faceting machine. The faster running Mark IV will speed pre-forming and occasional cabochon work. Comes with a solid state speed controller and an on/off switch coupled to a high speed permanent magnet, variable speed DC motor. The belt, pulleys, switch and extra long 3-conductor cord are factory assembled and wired to produce a full power continuously variable speed range of 0 to 600 RPM! Just plug it in and it’s ready to run. The sturdy castings are assembled on a handsome 9 1/2" x 17 1/2" walnut mica cabinet for easy cleaning and lasting beauty. Our dependable, fast, and easy faceting head is accurate to 1/10 of a degree. Our machine will do EVERYTHING competitive makes will do except it will cut faster, longer, and save you hundreds even thousands of dollars. The choice is easy ... GRAVES! Fully wired and Ready to Run Standard Dop Set, Transfer Fixture, Instruction Book, and all necessary tools. BEST FACETING MACHINE VALUE ON THE MARKET TODAY! 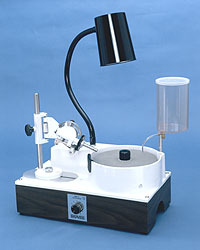 Order our Mark IV faceting machine COMPLETE. Everything you need to start cutting right out of the box! Please allow 4-5 week delivery. Includes the head and mast fitted with a carriage bolt, thumb nut, and nylon screw guide. A 32 tooth index plate is provided unless otherwise specified. 5/8" stainless steel precision ground rod, pressed into cast base and machined square. This is the accessory package alone as described for the Graves faceting machine when you buy the complete machine. Includes the standard supply kit (transfer fixture, instructional book, standard dop set, tools) along with the lap package.